If I was only allowed one ink, Waterman Serenity Blue would be it. While the color is not particularly special, I have had more bottles of Florida Blue (now called Serenity Blue) than any other ink. I love Serenity Blue because it is so well behaved. If I buy a vintage pen this is my initial go to ink because it is very easy to clean out of my pens. I have had no issues with this ink the 12 years I have been using it. No clogging, no staining, no nothing. The color is a soft blue, not a lot of saturation but there is good shading. I haven’t had any issues with feathering and it is not prone to bleeding. Serenity Blue is not lubricated and the flow is average to dry. The ink isn’t waterproof and is easily washed off the page. The dry time is about average. 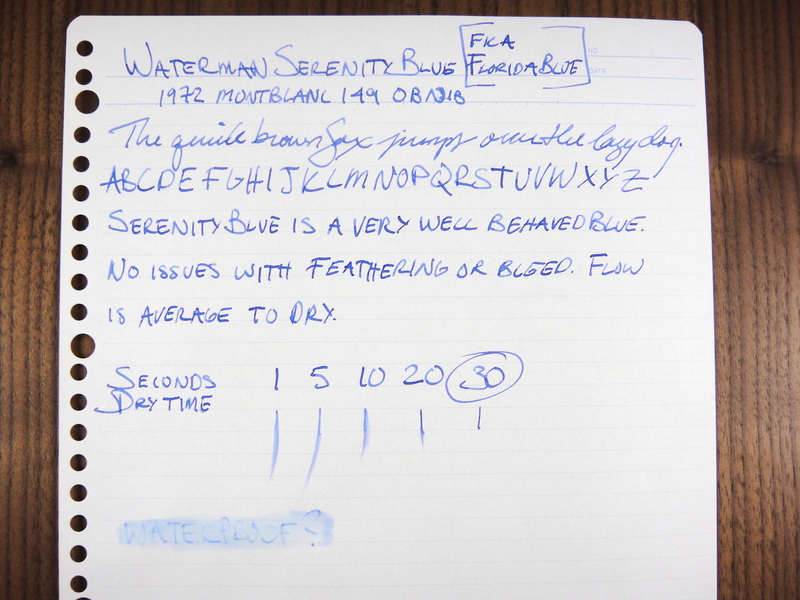 Waterman Serenity Blue is a staple that all fountain pen users should own.